Gretchen has been giving piano lessons at Music Makers for 12 years, and has been a musician for 25. Gretchen began her piano study with G Lloyd Merrill, a graduate of Julliard School of Music. At Berklee, she studied classical with two distinguished teachers, Edward Bedner and Larry Robertson, and jazz with the incomparable Dean Earl. After graduating from Berklee, Gretchen continued her jazz study with the renowned Charlie Banacos, and later with the talented composer and pianist, Consuelo Candelaria. She has performed professionally in several jazz combos and classical venues. She and her sister perform in Stone Sisters Jazz, a piano/vocal duo and you can find out where they’re playing by visiting Gretchen’s website, gretchenstonemusic.com. 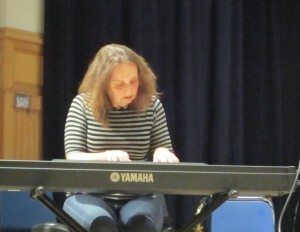 Gretchen is also a faculty piano teacher at Noble and Greenough School and Soloman Schecter Day School.